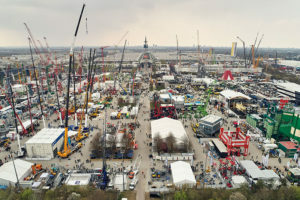 Bauma, the largest construction industry trade show in the world, set show records with more than 620,000 visitors at the 2019 edition of the week-long show in Munich, Germany. The 620,000 was an increase of 40,000 compared to the 2016 event. This year’s attendance was the highest total in the 65-year history of the show. Of the 620,000 visitors, 250,000 came from more than 200 countries outside of Germany. The top 10 countries represented outside of Germany were Austria, Italy, Switzerland, France, the Netherlands, Russia, Sweden, the Czech Republic, Poland and Great Britain. In addition to record-setting attendance, 3,700 show exhibitors spanned 614,000 sq. meters of show space. This also marked a record for Bauma. The 3,700 exhibitors came from 63 countries, further diversifying the show. “For the industry, Bauma is by far the world’s most important innovation platform and economic engine, something we clearly saw this year,” says Klaus Dittrich, chairman and CEO of Messe München, the show organizer. “Particularly in these times of sweeping technological change that is being triggered by digitalization, Bauma provides the industry with security and confidence.